The Social Inclusion Leaders’ Meeting in Valencia gathered over 60 National and Local project coordinators of Erasmus Student Network. During five days (17th to 21th of October) they were sharing the knowledge, ideas, and inspiration in order to increase the social impact of the network and prepare for the year ahead. Participants from all over Europe got to experience a variety of workshops related to the theme of Social Inclusion. Organised by ESN ev UV with presentations and workshops delivered by the International Team and ESN Eduk8 trainer, participants improved their skills, understanding of international projects and ESNs activity in the social inclusion cause. They learned to motivate Erasmus students to volunteer and to facilitate activities that promote social inclusion. We wanted to make the participants learn first hand how to organise activities and be in the shoes of international students, so together with the organising committee, we visited a local school, CEIP Pare Català, where all of us held 6 classes and represented our countries in a very non-formal way. The 160 kids had a unique opportunity to learn facts about 17 different European countries and also learn other languages from native speakers. 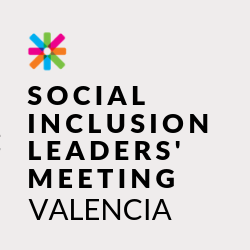 With Social Inclusion Days just around the corner, let's look back at the Social Inclusion Leaders' Meeting which took place in the beautiful city of #Valencia! Both national and local coordinators of this cause gathered not only to discuss, plan and get inspired but also to participate in a socially inclusive event themselves - presenting their culture to the children at the local school. We also organised a Human library activity with local organisations that have a social impact in the local community: Scouts Impeesa Mislata, Amics de la Gent Major, Campamento EiS, BIOagradables. The goal of this activity was to give the participants a different perspective in implementing social inclusion in other organisations outside ESN. As part of the event, we organised Erasmus for Social Inclusion conference at LA NAU Centre Cultural de la Universitat de València of Universitat de València - UV where the participants had a chance to learn more about international projects and initiatives of Erasmus Student Network that enrich the Erasmus+ programme including the new SocialErasmus+ project that focuses on the learning experience of the students during their volunteering activity, Social Inclusion Days and also other ways ESN contributes to social inclusion and education. Also, the keynote speaker Katherine Allison from Universities UK International shared her insights on widening participation in Erasmus+ programme and how to make exchange programmes more inclusive. Participants also got the chance to learn about MappED!, the project that aims to give equal opportunities to students with disabilities for their participation in the Erasmus+ Programme, providing information about their rights, procedures and support services they are entitled to. The meeting was a safe space where participants worked together to share ideas of best practices with their colleagues to prepare for the Social Inclusion Days, two weeks initiative that is coming in late November.